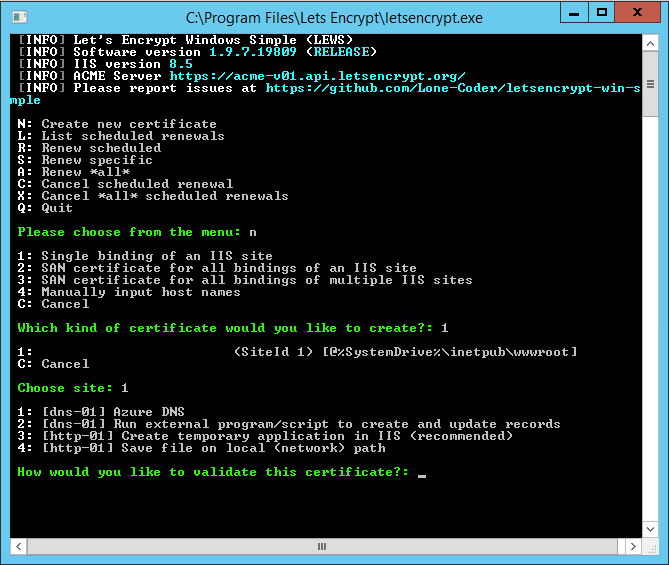 Let’s Encrypt is a free SSL/TLS certificate provider, with automated certificate issuance and renewal tools for Linux and Windows. You can use it to automatically issue and renew SSL certificates on your web servers. This guide shows you how to correctly setup Let’s Encrypt for Microsoft Window’s Remote Desktop Services and IIS using freely available tools. Let’s Encrypt is a great option for SSL/TLS Certificates, as the certificates can be renewed automatically (and it’s totally free!). I worked out this installation method after seeing the price of our upcoming Wildcard SSL Certificate renewal – I quickly realised the increased setup time would be quickly offset by the reduced certificate price. I’ve tested this process on Windows Server 2012 R2, with all RDS Role Services housed on the one server. You will need to modify these instructions and the script if you have split your role services amongst multiple servers. If all goes well, you should now have a new SSL Certificate installed in your IIS site. You can confirm this by opening your RDP site in a browser and checking that the SSL Certificate has been issued by Let’s Encrypt. 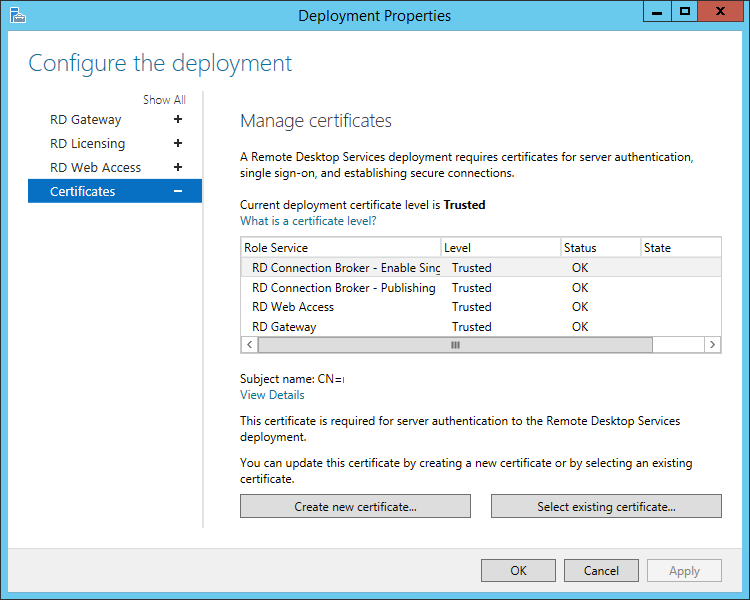 However, if you open Server Manager and navigate to Remote Desktop Services > Deployment Properties, you’ll see the four role services don’t have this new certificate. Our job now is to install the certificates into RDS. You could do so using the “Select Existing Certificate” button, but you’ll need to do this manually every 60 days as the certificate comes up for renewal. Instead, we’re going to use Powershell. Running this script within 10 minutes of generating the original certificates should allow it to install successfully. You can check this from that same Deployment Properties windows in Server Manager. 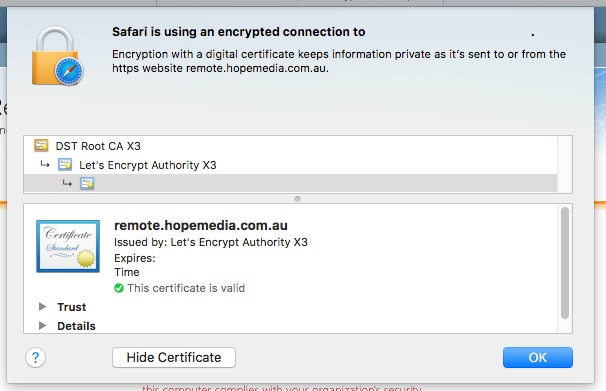 You can also try to access a Remote Resource and see which certificate it presents. "C:\Program Files\Lets Encrypt\letsencrypt.exe" --renew --baseuri "https://acme-v01.api.letsencrypt.org/"
Edit this script to contain the full path to your PFX file, and then schedule it to run in Task Scheduler once per day. The renewal will only take place close to the 60-day expiry window, and when that happens the Powershell script will update the RDS certificates. No one likes lapsed certificates or certificate warnings. Prevent this by subscribing to a free SSL Expiry Checker, such as CertificateMonitor.org (or the host-it-yourself version). That’s it! Hopefully these instructions have allowed you to install a Let’s Encrypt Free SSL Certificate in Microsoft’s Remote Desktop Server. If you have any tips, please post them in the comments below!